ConceptDraw DIAGRAM is a software for drawing the business processes based on BPMN 2.0. The Business Process Diagram solution contains many templates that allows to create of both simple and complex (nested) models of processes. 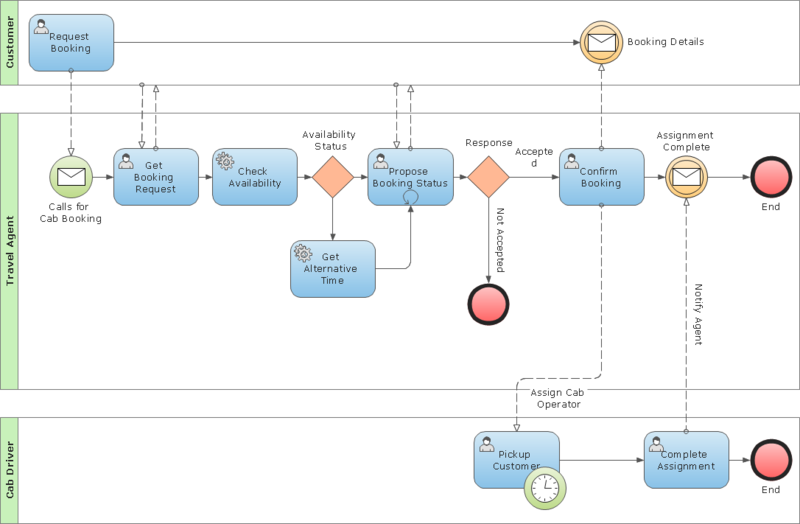 Pic.1 Collaborative (public) B2B process diagram BPMN 2.0 sample: Cab booking process. A public (B2B) process represents the interactions between a private business process and another process or participant. Only those activities that communicate outside the private business process are included in the public process. All other “internal” activities of the private business process are not shown. Thus, the public process shows to the outside world the sequence of messages that are required to interact with that business process. Public processes can be modeled separately or within a collaboration to show the flow of messages between the public process activities and other participants. ConceptDraw DIAGRAM v12 the best business process modeling tools.contains pre-designed libraries and templates based on the BPMN 2.0 standard that allows to create of both simple and complex (nested) models of processes.